We’ve had a busy month on the Harlem Valley Rail Trail. 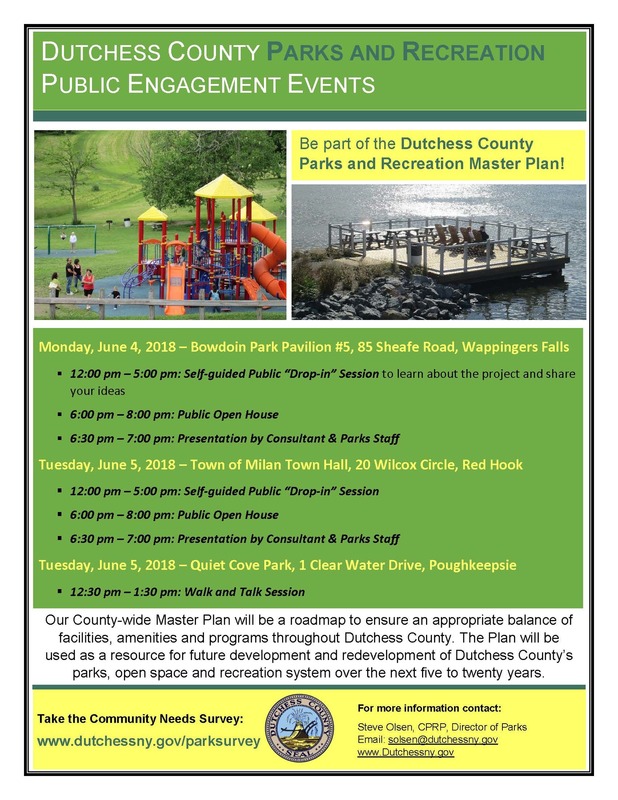 The Dutchess County Division of Parks is developing a new Dutchess County Parks and Recreation Master Plan and County Executive Marcus J. Molinaro encourages residents and visitors to participate in the plan’s development by sharing feedback and ideas about county parks. The public can take part by participating in this online Parks and Recreation Community Needs Survey and by attending public engagement events on June 4th & 5th at multiple locations throughout the county. Take a second to share your thoughts on what you love and what you think needs improvement by taking their brief survey here. Thanks to all the volunteers that helped install the Elinor Mettler Memorial Garden on May 5th for I Love My Park Day at Taconic State Park in Copake Falls. A beautiful, sunny, warm and breezy morning with great people doing something to give back. Take a look at the video! Thanks to the great group of volunteers from Key Bank who donated their time and efforts on the 23rd to help remove invasive vines and clear brush along the Trail at Under Mountain Road. Our beautiful Trail is sadly covered with trees being strangled to death with vines. The trees die, the wind knocks them down over the Trail, and we end up with less shade and more cleanup. Volunteers are what makes this Rail Trail great, and we could use your help. Sign up to be a volunteer on our website, http://hvrt.org/volunteer/, and help us continue to protect and maintain this local treasure. All of us eagerly anticipate the start of construction on the extension of the Harlem Valley Rail Trail from Millerton to Under Mountain Rd. We expect the project will go out to bid this fall and construction should start late this year or early next year. Very Exciting! We are in the process of designing a plan to cross route 22 and connect the two existing trail sections, one at Taconic State Park in Copake Falls and the other our new section towards Hillsdale. Come join us at the Hillsdale Flea Market this Saturday from 9 a.m. to 3 p.m. and we can share even more information with you on what is happening now and plans for the future. In addition to trail maintenance, we will be at several other local events throughout the year and will be doing trail user counts in the near future. We could use your help with all of them, and if you have the time and energy, we would love to see you. Please help us by volunteering today at http://hvrt.org/volunteer/.